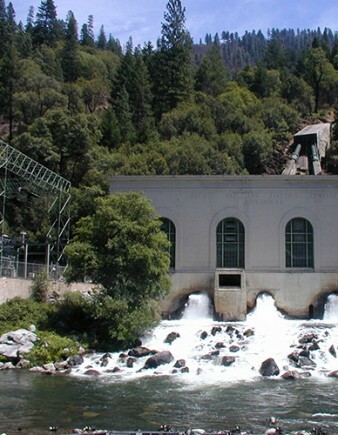 In 1999, the PG&E Company (PG&E) submitted an application to the California Public Utilities Commission (CPUC) requesting that it be permitted to break its hydroelectric system into several different lots or “bundles,” and to auction off these bundles to the highest bidder. In addition, PG&E proposed to auction its interest in all the land associated with the hydroelectric facilities. Auctioning the system in this manner is one way of determining its market value. Aspen managed preparation of a Draft Environmental Impact Report (EIR) that was published in November of 2000. The Draft EIR analyzed PG&E’s proposal, as required by the California Environmental Quality Act for the CPUC’s decision on the divestiture application. The Draft EIR listed the environmental impacts PG&E’s auction proposal is likely to produce. The Draft EIR found that the auction and transfer of ownership would likely produce changes to the way the hydroelectric facilities are operated. The Draft EIR’s study of the way the hydroelectric facilities would be operated under new ownership raised concerns about the exercise of market power in California’s electricity markets. The Draft EIR also concluded that the sale of 88,000 acres of “watershed land” outside the FERC licensed land would likely spur logging, mining, and other land development. The EIR concluded that the auction would produce 49 significant adverse effects on the environment. Two of those effects could be reduced or avoided or mitigated. Overall, the project effects could affect a range of resources, including fish and other aquatic and terrestrial plants and animals, recreation, and consumptive water uses. In addition, the EIR identified sixteen alternatives to the auction. The EIR ranked these alternatives according to how many impacts the alternative would avoid or mitigate. Nine alternatives would be environmentally superior to the auction. The best of these—having PG&E retain its hydroelectric facilities under CPUC regulation—would avoid all of the auction’s significant adverse environmental effects. Situated in the Sierra Nevada, Southern Cascade, and Coastal mountain ranges ofCalifornia, this system is strung along 16 different river basins and annually generates approximately five percent of the power consumed each year inCalifornia. Key components of the system are 68 powerhouses with a total generation capacity of 3,896 megawatts—enough power to supply approximately 4,000,000 residences. The proposed auction also includes approximately 140,000 acres of land proposed for sale with the hydroelectric system. The Draft EIR analyzed the range of operational changes that could occur under new ownership, including complex integrated models that analyze power generation and water management. The EIR studied the anticipated future operation of PG&E’s facilities under two scenarios. These scenarios capture a new owner or owners most likely operational strategies. The first is a “PowerMax” scenario, where the facilities are run so the maximum amount of power is generated at times of peak demand. Under the second scenario, the “WaterMax” scenario, the facilities would be operated to maximize the amount and reliability of water available for consumptive use. The EIR compared operations under the PowerMax and WaterMax Scenarios to a “baseline” that mimics how PG&E would operate the facilities. The baseline described expected operations of the PG&E hydroelectric system under restructured industry conditions. In order to describe the baseline accurately, the EIR engaged in a thorough review of PG&E’s operation of its hydroelectric facilities.